An important decision that employees have to make during the 2016 Federal Benefits Open Season is whether they want to enroll – or to reenroll – in a health care flexible spending account (HCFSA) for the 2017 plan year which begins Jan. 1, 2017 and ends Dec. 31, 2017. This column discusses HCFSAs and in particular how HCFSAs can benefit all federal employees, including those employees not enrolled in the Federal Employees Health Benefits (FEHB) program. A previous column discussed a Health Savings Account (HSA). Those employees who participate – that is, contribute to an HSA during 2017 – are not allowed to also contribute to an HCFSA during 2017. An HCFSA allows an employee to be reimbursed for qualified out-of-pocket medical, dental or vision expenses that the employee and tax dependents of the employee’s family incurs during the plan year. An employee can be enrolled in any type of health insurance plan in order to participate in the HCFSA. For example, an employee could be enrolled in one of the health insurance plans offered through the FEHB program, an employee could be enrolled in TriCare (the group health insurance program that covers members and retirees of the Uniformed Services), or an employee could be enrolled in a spouse’s health insurance plan offered through a private employer. In other words, there is no requirement that an employee be enrolled in the FEHB program in order to own and use an HCFSA. Annuitants are not allowed to contribute to an HCFSA. Employees who work for an Executive Branch agency or an agency that has adopted the Federal Flexible Benefits Plan (“FedFlex”) can elect to participate in the Federal flexible spending account program, called the FSAFEDS program. Employees who participate in the FSAFEDS program save money through the reduction of a portion of their gross salary to pay for their health care-related expenses on a before-tax basis. The HCFSA can be thought as a savings account that pays in a tax-beneficial way for out-of-pocket expenses typically not paid for or covered by a FEHB program plan, by a Federal Employees Dental and Vision Insurance Program (FEDVIP) plan, or by a privately owned medical, dental or vision insurance plan. 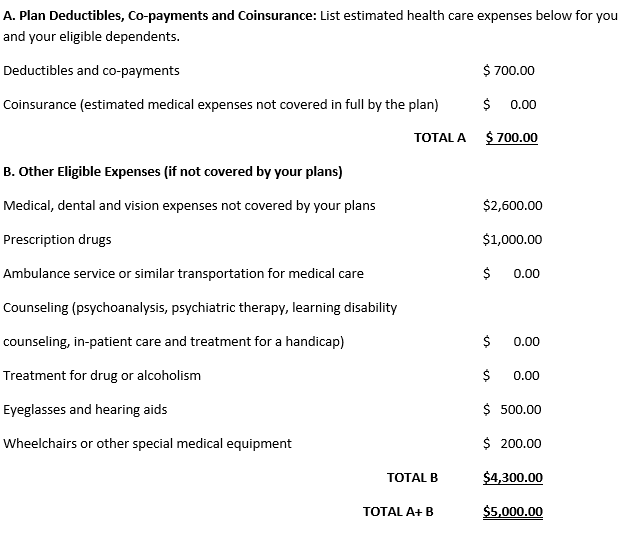 These expenses include deductibles, co-payments, and co-insurance. In particular, the money contributed to an employee’s HCFSA is deducted from an employee’s salary before Federal and state income taxes, Social Security (FICA), and Medicare Part A (Hospital Insurance) payroll taxes are deducted, resulting in overall tax savings ranging from 20 to 50 percent. The average tax savings for an employee earning $50,000 who contributes $2,000 to a HCFSA is approximately $600. That means the employee gets $2,000 worth of health care purchasing power plus saving approximately $600 in overall taxes. The FSAFEDS program has a calculator that allows employees to determine their overall tax savings given the amount of their medical expenses and marginal tax bracket. An employee must be eligible to enroll in, though not necessarily enrolled, in the FEHB program in order to enroll in an HCFSA. The HCFSA reimburses qualified health care expenses not covered or reimbursed by a FEHB program plan, a FEDVIP plan, or any other insurance program that an employee may be enrolled in including TriCare, or a spouse’s private company-sponsored health insurance plan. The eligible expenses of the employee, the employee’s spouse, and eligible tax dependents (including adult children through the end of the calendar year in which they become age 26) may be reimbursed through the HCFSA. During 2017, employees can contribute to their HCFSA from a minimum of a $100 to a maximum of $2,600. Note that the IRS recently raised the maximum amount to be contributed to an HCFSA from $2,550 during 2016 to $2,600 effective with the 2017 plan year. Spouses of employees who are also Federal employees can also contribute annually a maximum of $2,600 to an HCFSA during 2017. Qualified medical expenses are those specified in the plan that would generally qualify for the medical and dental expense deduction on an individual’s Federal income tax return (Schedule A). These expenses are explained and presented in IRS Publication 502 (Medical and Dental Expenses), which can be downloaded at www.irs.gov. Also, non-prescription medicines other than insulin are not considered qualified medical expenses for HCFSA reimbursement purposes. A medicine or drug will be a qualified medical expense for HCFSA reimbursement purposes only if the medicine or drug: (1) Requires a prescription; (2) is available without a prescription (an over-the-counter medicine or drug) but the individual get a prescription for it; or (3) is insulin. Note that no type of insurance premiums – whether it be for health, dental, vision or long term care insurance – may not be reimbursed from a HCFSA. The FSAFEDS program provides a list of eligible expenses and services to be reimbursed under a HCFSA. These eligible expenses and services may be viewed at https://www.fsafeds.com/explore/hcfsa/expenses. Also includible in eligible reimbursable expenses are travel expenses (mileage, parking, tolls) to and from the doctor, dentist or hospital. Those employees who are enrolled in a High Deductible Health Plan (HDHP) with a HSA are not eligible to enroll in a HCFSA. But these employees may be eligible for a “limited expense” flexible spending account, known as a “LEX HCFSA”. A LEX HCFSA reimburses employees for eligible dental and vision expenses not covered or reimbursed by the FEHB and FEDVIP programs or other insurance programs. To be eligible for a LEX HCFSA, an employee can be enrolled in a HDHP during 2017 and contribute to a HSA during 2017. The employee can request reimbursement from the HSA for qualifying dental and vision expenses incurred by the employee, by the employee’s spouse and tax dependents (including adult children through the end of the calendar year they become age 26). There is an annual maximum contribution to a LEX HCFSA of $2,600 per employee. An employee’s spouse who is also a Federal employee can have a separate LEX HCFSA with a maximum contribution amount of $2,600. In order to participate in an HCFSA for 2017, an employee needs to make two decisions. First, whether the employee want to participate in an HCFSA; that is, contribute to an HCFSA during 2017.Those employees who participated in the HCFSA for 2016 must reenroll for 2017.Second, how much does the employee want to set aside of his or her paycheck to the HCFSA for 2017. To answer this question, the employee should look back to 2016 and determine how much the employee has paid out-of-pocket for medical, dental and vision expenses for the employee and members of the employee’s family. The following worksheet can be used by employees to assist them in determining that amount. Susan is a married Federal employee with four dependents (two children and two parents). Susan participates in the HCFSA, and sets aside $2,550 of her salary. Susan’s husband Bob is also a Federal employee and Bob also sets aside $2,550 of his salary to his HCFSA. Susan and Bob budget for the following anticipated out-of-pocket medical expenses for 2017: (1) Co-payments of $200; (2) Deductibles of $500; (3) Orthodontics for the older children for $2,000; (4) Eyeglasses for Susan and Bob for $500; (5) Vision care for the family not paid for by insurance, $600; (6) A wheelchair for Susan’s father $200; (7) Hearing aids for Susan’s mother, $1,000; and (8) Prescription drugs for Susan’s parents totaling $1,000. Based on these out-of-pocket costs, Susan and Bob should each plan to set aside $2,500 to their HCFSAs for 2017. Eligible employees can enroll in FSAFEDS each year during the Federal benefits “open season”. This year’s federal benefits “open season” enrollments will be held from Nov. 14, 2016 through Dec. 12, 2016. Enrollment is made on www.FSAFEDS.com. Elections made during open season will be effective Jan. 1, 2017. Eligible expenses for reimbursement must be incurred between Jan. 1, 2017 and Dec. 31, 2017. Effective with the 2015 plan year, HCFSA owners are able to carry over up to $500 of unspent funds into the next plan year. Note that if an HCFSA owner wants to carryover up to $500 of unused HCFSA funds to 2017 but does not want any additional HCFSA funds to be withheld from his or her salary during 2017, he or she must still reenroll in FSAFEDS for 2017 during the 2016 “open season”. With the increasing costs for medical, dental and vision care that employees and their dependents are facing, the HCFSA is a cost beneficial way to pay for these costs. There are no restrictions as to which type of health, dental or vision insurance employee has to be enrolled in in order to participate in an HCFSA. Finally, the tax savings alone resulting from HCFSA participation should give every employee an additional incentive to participate in an HCFSA for 2017. The HCFSA program is administered by WageWorks, Inc. Additional information about the program including forms and enrollment information can be obtained by going to the FSAFEDS https://www.fsafeds.com.